The Tusk 10 Piece Hex Key Wrench Set is a durable T-handle Allen wrench set perfect for any shop or race trailer. Made from vanadium tool steel with a tough and comfortable plastic handle. This Allen wrench set comes complete with a freestanding steel stand. The stand includes mounting holes on the back and bottom for the option to be mounted on horizontal or vertical surfaces. Tusk specializes in quality tools and products for your motorcycle, ATV, and UTV. T-handle design provides comfort and convenience. Made from hardened and tempered vanadium steel with a custom molded handle. Complete with a freestanding steel stand that includes mounting holes for the option to be mounted on horizontal or vertical surfaces. Contains the following sizes: 2, 2.5, 3, 4, 4.5, 5, 5.5, 6, 8, and 10mm. Indispensable for those who work on their bike. In my opinion a must have. Of course who doesn’t like good tools. Soooo much easier to use than typical allen keys. These are a must have if you work on your own machine. Awesome! If you are a DIY Don’t think about it buy it !! This tool set is worth the price for the home mechanic and it's priced right. Upside is the tools are easy to locate in the rack and the handles have a comfortable feel and grip. The downside is that the metal is softer than I would like. Still usable for most situations but the edges can round a bit when trying to remove a stubborn screw. If you've never owned a set, at this price point just put in your basket and when your looking for the right hex size youl'll be glad you got em. They make tightening and removal so much easier than an L shaped hex key. I use this for everything. I put together the wife's Ikea furniture with it. Also woks good on the motorcycle. Not the best quality handles in my opinion, but they work, the rack is great for keeping things organized, and they're all labeled, which is nice. Love my new T Handle set! Shipped on time. Great quality and comfort. Was looking for a t-handle set and saw Tusk makes one ! Just what I needed, quality seat, at a killer price! Ya can't beat that! These T handle wrenches are high quality tools at an awesome price. Much higher quality and even cheaper than the ones I looked at at the local discount tool store. They are great and useable tools for the price. They last long and they are really durable. I like this for the price, they came with the holder that can bolt on the wall, or a bench. The only thing they make is I wish they had the BALL ends to be able to function on angles. A great addition to your tools. This is a great set. Honestly my biggest complaint is that it is sometimes hard to get them back into their holder if you aren't looking at it. I knocked down the durability a bit since I don't quite trust them for really stuck on bolts. Hopefully no one uses them for that anyway. Must have set for working on your bike. A little annoying how tight they are together... makes pulling and replacing them a hassle. Other than that perfecto. These work great, much more beefy than the little allen keys. So often when using these types of tools finding the RIGHT size is nearly impossible. Then when they don't quite fit into the space provided you are in trouble, switch it this way and then that way. This set is well labeled and the T handle makes it easy to use and keep track of the "right" size. When in the garage and your looking for an allen wrench to fit the bolt your on its annoying dumping everything out and trying to locate it. Since having these in the garage stress levels have gone down..... looking for tools. hahaha i can never find that 10mm! Wasn't expecting much when I bought them but they have held up and busted loose some pretty tight allens with out breaking or stripping. This is my second set . They are a great value. Truly love them . Would highly recommend . 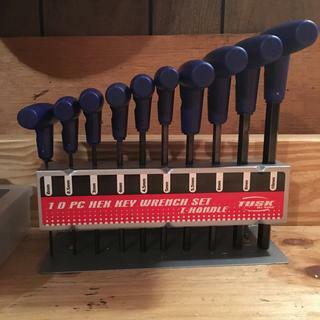 Very practical hex key wrench set, much better and easier to use than you traditional "L" shaped Allen key set. The handles have been taking quite a beating while tightening bigger 8mm and 10mm bolts and still no sign of damage. Absolutely recommend it. The set is well constructed and works as advertised. The caddy is especially easy to use and clearly shows the sizes and is constructed as solidly as the tools themselves. It is a product I would highly recommend. good set, concerned plastic handles might fail over time where they meet the metal, but so far they work great, nice holding rack as well. Great product, especially for the price. Good quality and looks great. These keys work great! I love the stand they sit in, it makes it very convenient to grab the size you need! comfortable handles, good quality steel, handy, good price. The holder is useless but the tools work fine. The work on quads are bikes must have tool makes life so much easier. I used this wrench set yesterday while taking my motorcycle apart. The wrenches were very handy and sturdy. Great product. 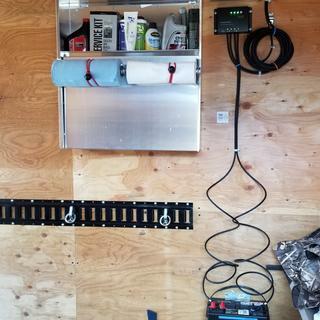 The quality of the tools and organizer very nice. My son does a lot of the teardown and assembly of our dirtbikes, atv's, etc. He said this was one of the best things I ever got. It makes life a lot easier and faster to teardown and to re-assemble. He is only 15 by the way. I bought two of these. one for my home tool box and one for the work one. so far they hold up well to both machine shop and general hard useage. will buy again. Sure beats fumbling through a bag trying to find the correct size allen. I like em. Great durability. Does exactly what I need to do! This kit has saved me a lot of time when doing maintenance, it works well, has a great storage stand, and are much quicker than multi tools. Some have mentioned it being flimsy; however, I have not had this issue. If you're applying the right amount of torque for the size of bolt it works well and the flex is a good indication if you are applying to much torque. Good tools, sits nicely on the tool chest! This set is nice and can be mounted on the wall. i have been using them over a year with only positives. I have had this hex set for a few years now. I have used them multiple times on many different motorcycles and they have worked great! Usually when tools don't cost much they don't last too long. However, these have been well worth the money and have more than outlived my expectations! Will buy another set if I ever need to. Just wish they made a standard set also, you know, for those American made motorcycles. Haven't used them too much yet, but they seem to be fairly sturdy, and you can't beat the price! Does it have the short bit on the handle? BEST ANSWER: Hey Larry, it is only the handle and the long bit. No short bit. Hope this helps. No they do not have a short bit on the handle. They do not. Would be handy tho. BEST ANSWER: I have the metric set. They are good quality and I love the rack. 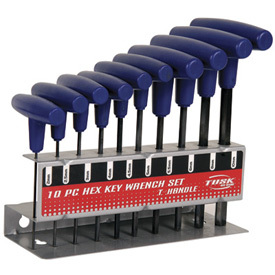 BEST ANSWER: The Tusk 10 Piece Hex Key Wrench Set is made in Taiwan.